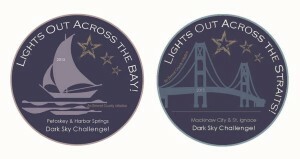 The Mackinac Bridge Authority agreed to turn off the bridge’s lights for the Lights Out Challenge. This photo shows the bridge with the lights on. The photo below show it with the lights off. Photo by Eric Lanning (CC). Every year in August, the Perseid Meteor Shower comes to its peak of activity, and all over Northern Michigan, the lights go out so the stars can shine more brilliantly. Spearheaded by Emmet County’s Headlands property, an International Dark Sky Park designated by the International Dark Sky Association in 2011, the annual “Lights Out” challenge draws thousands of enthusiastic visitors to the area, for picnics, stargazing, and friendly, community-wide competitions. 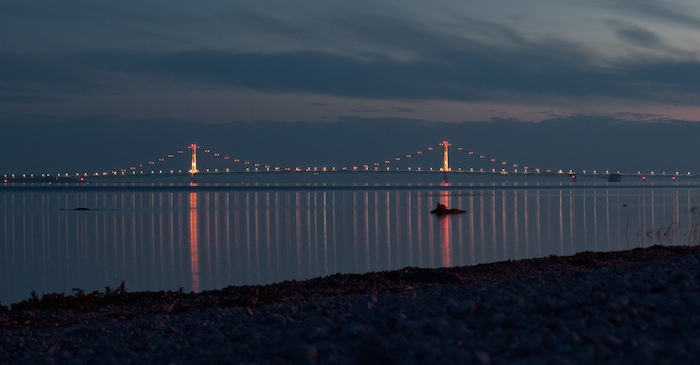 The Mackinaw Bridge in Michigan with its lights off – thanks to the Bridge Authority – for the annual Lights Off Challenge. And though the water is an advantage to the competition, Adams explained that communities that don’t enjoy the same geographical features are not inhibited from undertaking the same kind of activity. Identify area stakeholders that have easy community access portals and invite them to help get the word out, such as Chambers of Commerce, Convention and Visitors Bureaus, local newspapers, transportation authorities, libraries, radio and television stations, business owners, local municipalities, including cities and townships. Plan your event to coincide with celestial phenomena and identify lines of demarcation between communities (e.g., in Northern Michigan, we challenge the communities of Mackinaw City and St Ignace across the Straits of Mackinac from one another, and Petoskey and Harbor Springs, across the Little Traverse Bay from one another, to see who can get darkest from 10:30-11:30 p.m. the night of the Perseid Meteor Shower each year). Market your challenge. The ideas are endless and include creating logos and pledge forms that individuals and businesses can display in their windows, t-shirts, buttons and the awards for winners (e.g., plaques or dedicated benches that can be conversation starters about dark skies or even having the losing town do a pancake breakfast for the winner). Here is a sample pledge form. See the sample logos above. Make sure all materials include ready-to-use facts about why dark sky protection matters as well as information about viewing celestial phenomena once the lights are turned off. “In Emmet County, we had fun with our pledge form, fashioning it after the American Constitution,”Adams explained. To learn more about the Lights Out challenge, read our previous blog post on the topic.